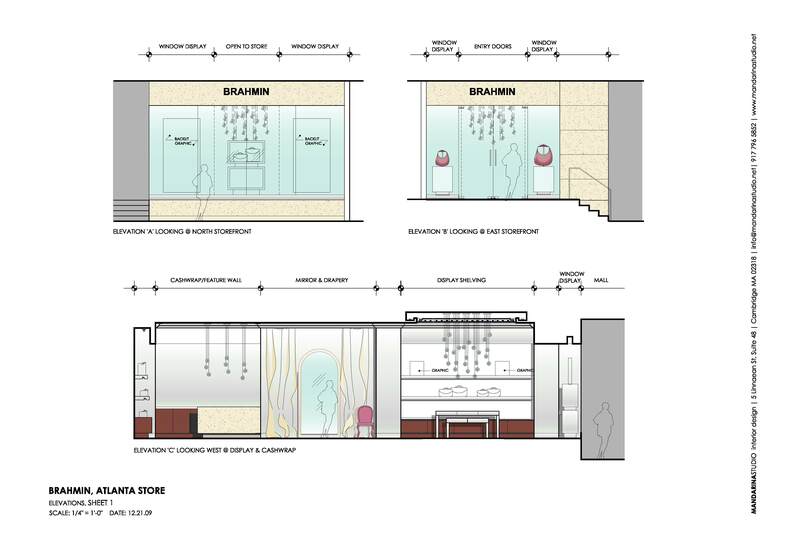 I’m really excited to finally be able to share some photos and design drawings of this retail design project that has recently completed. The client is BRAHMIN, a family-owned handbag company with design, operations and manufacturing headquarters in Fairhaven, Massachusetts [continue reading here]. 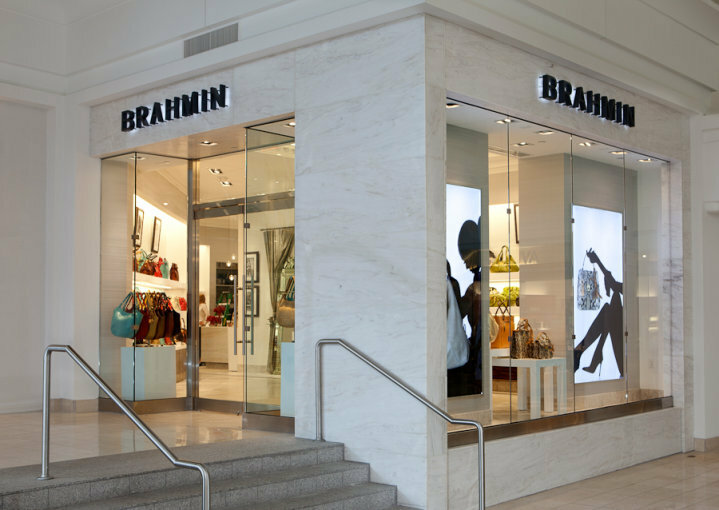 BRAHMIN is expanding and the store concept was to create an elegant space that blends modern lines with traditional elements and rich materials to echo the quality and craftsmanship of the handbags. 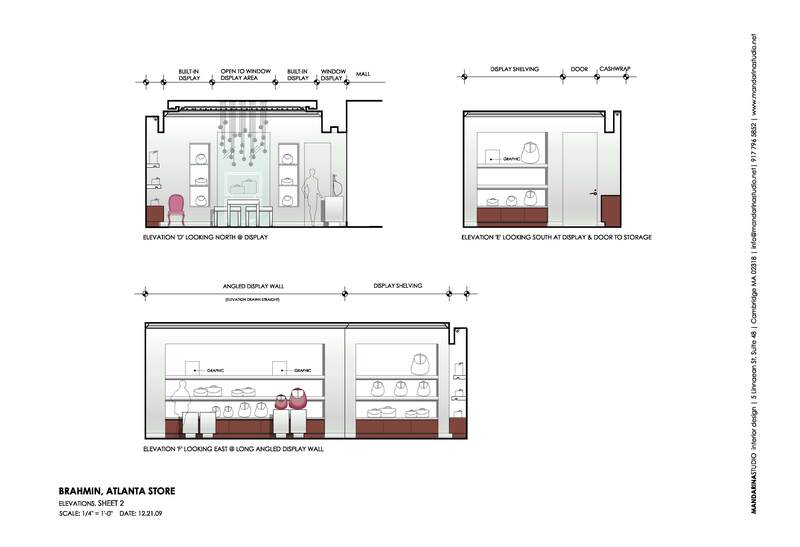 The new design will establish a standard for the brand and set the tone for future stores. This was such a fun project made even better because it was a creative collaboration between my design firm, MANDARINA STUDIO and MDG Brand Innovation. 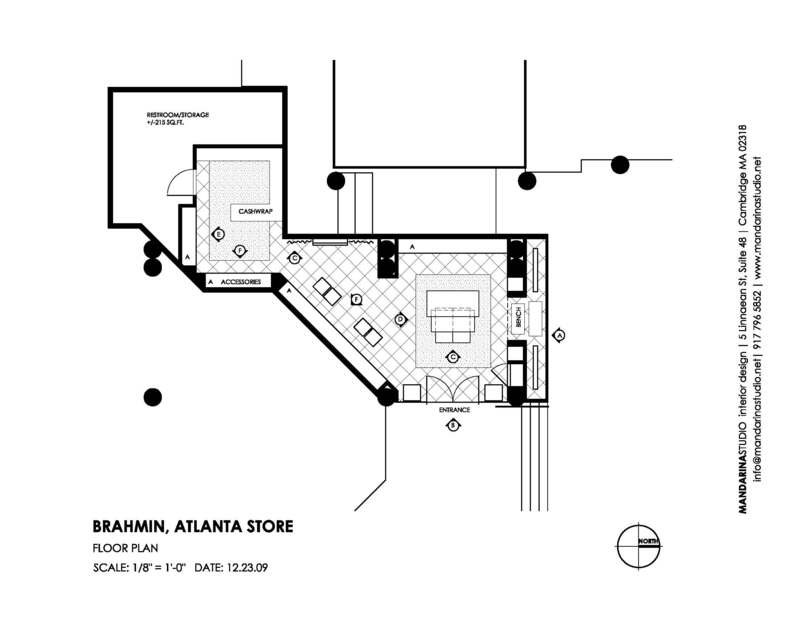 The BRAHMIN store at Atlanta, Lenox had their Grand Opening event last Thursday [see photos] and the Dallas Grand Opening event is scheduled for May 13th. Please stop by to say hello if you are in Dallas – I’ll be there! 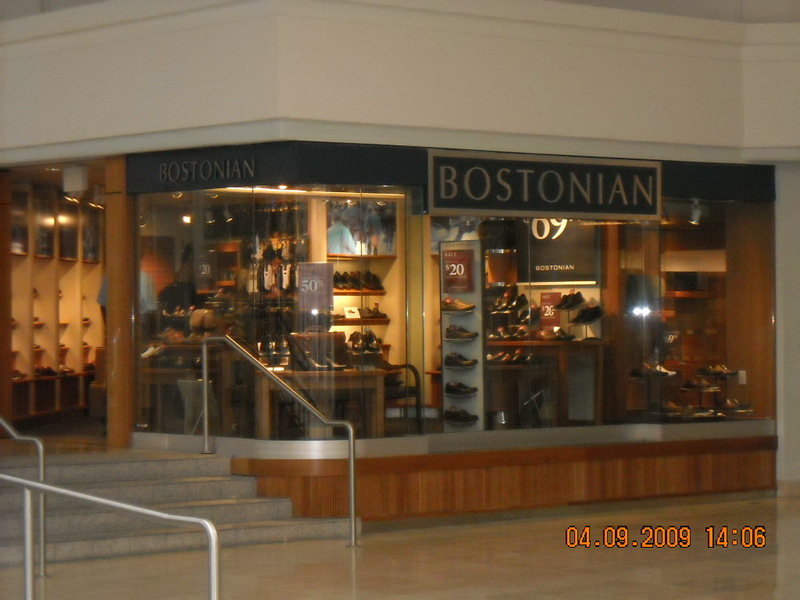 The footprint of the store presented a challenge because it was divided into two segments with a narrow opening between the two areas which could have made the store feel disjointed. The final Floor Plan above turns this into a positive feature by creating a long display wall that joins the two areas – this not only directs the traffic pattern and leads shoppers to the rear of the store, it also creates a bit of drama as the store and collection is slowly revealed to the customer. The new collection is displayed in the front of the store while the rear is for the classic collection. The BEFORE storefront above has a glass corner that reveals the entire store from the mall. The new design in the AFTER image below has a solid corner clad in elegant stellar white marble slabs. The effect reinforces the idea of mystery and slowly unfolding the store to pique the interest of shoppers. 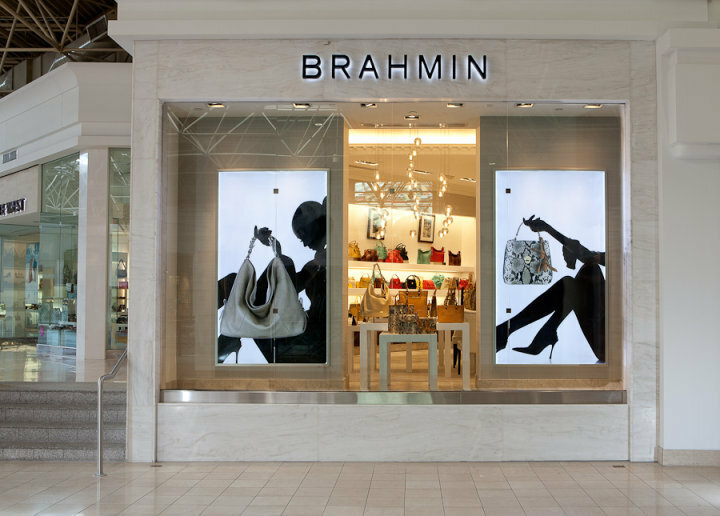 Please stop by if your in Atlanta, we’d love to hear what you think of the store design and the wonderful BRAHMIN handbags!! Gorgeous! The silhouettes holding the bags are just great. Thanks for sharing. very impressive. humongous improvement from before. you’re developing quite the interior design niche with retail and restaurant. soon you’ll be taking over newbury st! 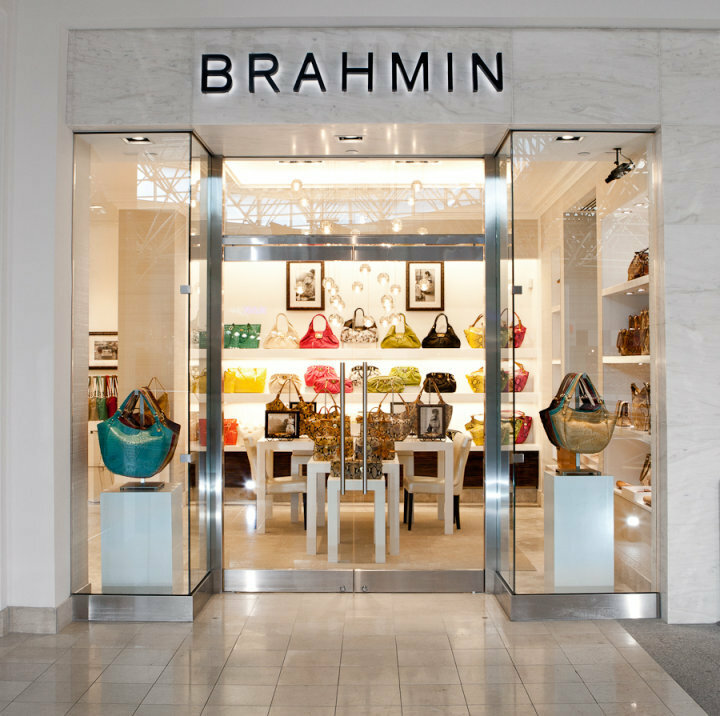 Interesting modern retail spaces, like this one for Brahmin, are a reason I enjoy window shopping. Lenox Square can be a formidable shopping environment and merchants must project a high end patina in order to attract customers. I would space this engaging commercial design above efforts from Coach and on the same level as Louis Vuitton and Gucci. Thanks alot mate BRAHMIN, this is a really nice Atlanta Photos + Design Drawings 🙂 I’m bookmarking this page! !